Figaroscope, the culture magazine published by Le Figaro, recently conducted a study to find the best flan nature in Paris (table of results set forth below). Flan is not something I eat often, but I was intrigued and determined to try some of the flans that Figaroscope considered the best. Besides, someone has to keep Le Figaro honest, however unpleasant the job. Second stop was the runner-up, Poilane. Also delicious and quite similar. Perhaps a touch less vanilla and a touch less color on the top, but really the equal of l'Autre Boulange's flan, and in a neighborhood where you are much more likely to find yourself. Next was a deviation from the published order, Gérard Mulot (ranked sixth). This had the best crust so far, was very dark (but a little too uniformly so) and somewhat less aggressively unctuous and vanilla-y than l'Autre Boulange's. Close call. After this I tried Gosselin (ranked third), whose flan is very light-colored and more lightly (and pleasantly) flavored. However, I thought it had a really weak crust, flat and thin. Tied for sixth with Gérard Mulot is Cohier, which also only had cherry flan when I visited. I tried this and found the taste and texture to be satisfactory, but the crust to be nearly tasteless. I presume the crust for the nature is similar. Next, the Juliens. First, I then strayed from the list to try the flan of the excellent boulangerie/pâtisserie Julien at St-Philippe-du-Roule, which is not on Figaroscope's list. This had a mild taste but excellent crust, important because it is served in individual round tart crusts rather than in slices. Then the Julien that is on Figaroscope's list (ranked ninth), which was very light in color, delicious in taste but with a thin cardboard-like crust. Finally, I got to Dalloyau (ranked fifth), one of my favorite pâtisseries in Paris and one that, like Gérard Mulot, is good in all domaines of the field, including tarts; financiers, pâtes de fruit, chocolates, croissants. I was optimistic based on past experience, but was disappointed in the end. Dalloyau's is an individual flan in what I think is a puff pastry crust. It lacks the intense flavor and unctuous texture that most of the others displayed and would not make my list. So, having tried seven of Figaroscope's top ten and one additional one, I have reached some conclusions. I agree that l'Autre Boulange sets the standard for flan nature; it is as near to perfect as I found. After that, I give more weight to the pastry than the Figaroscope judges; thus my second choice was Gérard Mulot on the strength of their excellent pâte brisée and fine classic custard. In addition to being quite delicious, flan is a real deal. Seven of the ten top-ranked were 2.10 euros or less for a big slice. Only Gérard Mulot (2.70 euros) and Dalloyau (3.70 euros but for a whole individual flan) were more than 2.50 euros. So trying a bunch of flans (even eating less than half of most of them, as I did) is a good way to find a reason to go into those tempting little bakeries that you see all the time as you walk around Paris. Talk about screaming bargains! I dined tonight at Le Hide, a small restaurant near the Etoile that is Pudlo's Rapport Qualité-Prix de l'Année for 2009. The food is excellent and at 29 euros for the three-course menu (or 22 for the two-course formule) is one of the best deals in Paris. The chef-owner, Hide Kobayashi, trained with Jean-Pierre Vigato (Apicius), Dominique Bouchet, Joel Robuchon and at Taillevent, and this shows in his cooking. There is nothing Japanese about the well-prepared cuisine, which is French French French. I tried to stay light -- everything is relative -- so went with the white asparagus starter and roasted chicken breast on risotto finished with truffled olive oil. Both were perfectly cooked, although the accompanying risotto evinced the normal lack of understanding of the Italian technique that bedevils even good French chefs. For dessert I had the "café gourmand," coffee served with a mini-crème brûlée, a mini-chocolate pot de crème and a little ball of caramel ice cream. There is a small but nice list of wines served by the glass or in 50 or 75 cl. carafes; I had the Chinon recommended by Pudlo and was not disappointed. My neighbors had the very tempting foie gras poelé sur haricots verts and the rack of lamb and were very happy. I saw and heard oohs and ahs for the more substantial desserts. And a number of tables were filled with regulars who were greeted with kisses at the door. From all this, I am pretty sure that my own good experience is typical and therefore am comfortable recommending le Hide based on just one visit. Le Hide, 10, rue du Général Lanrezac, 75017 Paris (Métro Etoile), 01 45 74 15 81. The best udon noodles I have found outside Japan are at Kunitoraya, 39 rue Ste-Anne, in Paris. 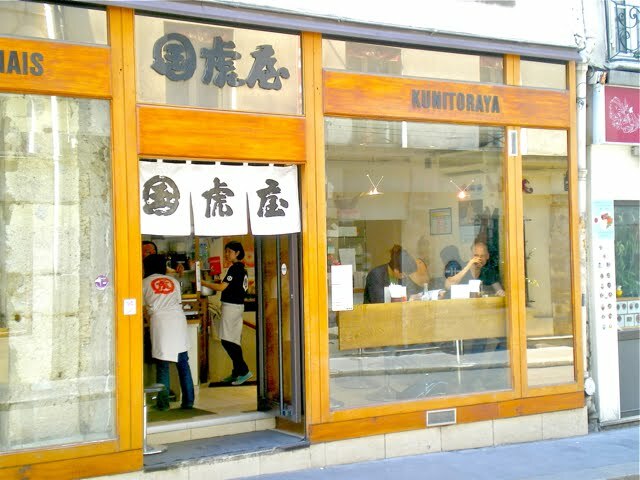 A Japanese friend who spends several months a year in Paris told me about this place a couple of years ago, and I try to get there once each time I am in Paris to enjoy the totally authentic kitsune udon. There is nearly always a line, but if you go after 1:45 you probably won't wait more than a couple of minutes. Rue Ste-Anne, near Opéra, is home to dozens of Japanese restaurants, including the best ramen place I have found in Paris -- Sapporo -- which has a branch next door to Kunitoraya at number 37. Upon the recommendation of a good friend, I went to the highly regarded Caméléon tonight and had a really good meal. This is a very classy Montparnasse bistro run by the chic Jean-Paul Arabian. The food is classic but yet new: imaginatively prepared and presented. Prices are high at dinner for this type of food (38 euros for my main course), although there are a 25-euro formule and 30-euro menu at lunch that are real bargains. I had the signature pavé de foie de veau with gratin de macaronis au parmesan (calf's liver with macaroni and cheese), and it is a triumph. The pavé is an enormous piece of liver, about 2" by 2" by 4", that is perfectly caramelized on the outside and tender pink within. The mac and cheese, served in a piping hot Staub casserole, is also fantastic and would make a fine meal by itself. Knowing how huge the pavé would be, I had no starter, but for dessert I had the nougat glacé maison, served with a mixed berry coulis, which also was delicious. My friend had the pain perdu with bananas and caramel and reports that it, too, was excellent. Although I have only been there once, my friend is reliable and so are Pudlo and Lebey, both of which give Caméléon excellent reviews, so I am comfortable recommending it. Especially for lunch as long as you don't need to do too much in the afternoon. Caméléon, 6 rue de Chevreuse, 75006 Paris (Métro Vavin), Tel 01 43 27 43 27. I have heard from a number of sources about Itinéraires, a relatively new "gastro-bistro" in the fifth arrondissement. It is a "coup de coeur" in the new Pudlo, which I believe is the best Paris restaurant guide. Also, a recent post by Barbra, of the excellent blog Serve It Forth (www.serveitforth.com), made it sound tempting. Based on these and other reviews, I went at the earliest possible time, which was last night. I am sorry to say that I was quite disappointed. I started with asparagus with hollandaise "revisitée," served with some small slices of prosciutto di parma. I was excited at the prospect of my first white asparagus of the season, but they were seriously undercooked, and the very light and, I think, parmesan-flavored hollandaise (presumably this was what "revisitée" meant) didn't coat the asparagus; the prosciutto seemed to be an afterthought. In short, the whole didn't hang together due, I believe, to the hardness of the asparagus. For my main course I had suckling pig (cochon de lait) rolled up, roasted to perfection and served with pureed potatoes in two textures. Perfectly prepared and delicious! Dessert was a green chartreuse soufflé which tasted fine but had so much residual alcohol that it caught in the throat. The place is nice and reasonable (36 euros for a three-course meal), and also creative and ambitious -- nearly everything on the menu sounded really good. However, based on my meal, consisting of one good dish, one bad and one near-miss, I really can't recommend this restaurant. I plan to try it again, though, on the theory that I just had bad luck, and hope to be able to report a better experience. Itinéraires, 5 rue de Pontoise, 75005 Paris (Métro Maubert-Mutualité), 01 46 33 60 11. When I told people that I had ordered an eighth of a pig, they inevitably asked, "which eighth?" It was a little sad to explain that it was all butchered and packed in freezer ready heavy plastic bags. The quarter that came weighed in at about 40 pounds, more than the 35-pound estimate, and consisted of a leg, a shoulder roast, some ribs, pork chops, bacon, breakfast sausage, pork osso bucco, ground pork, etc. No exotic cuts or organ meats were included. Red Wattle meat tends to be a little darker than most other pork and is very tender. The variety boasts wonderful hams and sirloin steaks and a juicy and flavorful taste even though the meat is lean. The Red Wattle is perhaps the most severely at risk variety of pork in the United States. This pig, which gets its name from its red color and the wattles that hang under the chin, originated in New Caledonia, came to New Orleans in the 18th century and lingered in the forests of Texas. Larry and Madonna Sorell of Glasco, Kansas [whence our pig], lead a network of four families who are among the last in the world raising the Red Wattle." In short, we were getting a pedigreed, appropriately raised and delicious pig. So, what did we do with it and how was it? I invited some friends to share a meal featuring this pig. We were nine. After hors d'oevres and guava/peach bellinis, we started with delicious fennel sausages that I made from the ground pork, following a recipe from Wolfgang Puck. I then cut the sausages into bite-sized bits, browned them, added 8 ounces of balsamic vinegar of not great quality and boiled it down to a dense syrupy sauce (recipe from Michael Chiarello). Served over v e r y slow-cooked polenta (recipe from Paul Bertolli), this was a nice start. For the main course, I made Pernil, a Puerto Rican preparation (recipe from Ingrid Hoffman), accompanied by red quinoa and chopped collard greens. I marinated the pork overnight in a garlicky, citrusy adobo marinade that included Goya brand Mojo sauce, made with bitter oranges. Then I roasted the pork for 5 1/2 hours: 450º for 1 hour and 350º for the remaining 4 1/2. The sauce was delicious, but I found the pork a bit -- certainly not falling off the bone as advertised -- so the natural goodness of the pork was less evident than in the sausages. Next time, lower and slower after the first hour. The meal was completed by a wonderful flourless chocolate cake baked by one of the guests. Piglet made pork chops and also found them a touch too dry. She tried again and was much happier. She also made some of the bacon and it was great. So, the bottom line on the Red Wattle pig is that it can taste great, but one must be careful to avoid overcooking the leaner cuts. The description says this breed is naturally lean, and it's true. And in any event, it feels good to eat pork from a pig that is raised the way it should be. If we ever get to the bottom of the freezer full of Red Wattle pork (now down to 10 pounds), I'd like to try again. Next time, though, Piglet and I have agreed to try to a fattier Berkshire or Duroc. Based on comments to my earlier post "Chocolate," most of which have been oral, I need to update it. Walking by the Jacques Torres store on Amsterdam between 73rd and 74th, I felt compelled to go in and give it a try. I bought two bars, "Dangerously Dark," a plain 72% chocolate and "The Wicked Bar," dark chocolate with notes of ancho and chipotle chilies. The Dangerously Dark is very good indeed, the other less successful once the novelty wears off. A friend who is a good cook and serious about chocolate says that Jacques Torres' cooking chocolate is "hands down" the best available. I will certainly try this soon. At the recommendation of two chocolate aficionados, I tried a bar of Pierre Marcolini's 72% Pure Origin Venezuela chocolate, and I must admit it is great. However, it is stupefyingly expensive: an 80g bar costs $11.00 plus tax! More than three times the cost of a 100g bar of Lindt. At these prices, it is easy to limit yourself to one ($1.30) square after dinner, so perhaps that's a good thing. I have been working on a banana soufflé recipe and finally gotten it to the point where it is ready to share. The recipe includes no egg yolks and uses agave syrup instead of sugar to caramelize the bananas. Agave syrup is better for you than sugar because it has a low glycemic index nearly as much, and therefore does not raise your blood sugar and trigger a large release of insulin to metabolize the sugar. The soufflés are easy to make, and can be made several hours before the 10 minutes or so that it takes to bake them (while you are on your salad course). 1. Melt butter over medium to medium-high temperature. Add bananas and cook until they turn golden brown. 2. Add the agave syrup and cook until bananas are well caramelized. Deglaze with the yogurt and cook until yogurt liquid disappears. 3. Beat the banana until smooth (or almost). Set aside to cool. 4. Whip the egg whites until pretty hard peaks but not dry. 5. Add 1/3 of whites to banana mixture. Fold in the rest. Fill four 8 oz ramekins halfway, add ¼ of the chocolate chips to each, then fill with remaining whites. Place on a pan and move to fridge until ready to cook (the soufflés will keep for a couple of hours). 7. Swirl (optional) caramel syrup over the top of each soufflé. You could use regular yogurt, but should use ¼ cup because it has nearly double the liquid compared to Greek style yogurt. I intend to try peanut butter chips instead of or in addition to chocolate, but haven’t yet. It turns out that everyone in New Haven and everyone who has been to Yale knows this place, but it was a revelation for us New Yorkers. It is almost worth the drive from New York for the pizza alone. Pending my return to New Haven, I've got to figure out how to make this, although it will certainly be a far cry from the original. Are San Marzano Tomatoes Really the Best? The May & June 2009 issue of Cook's Illustrated arrived last week and included a nice recipe for "Best Quick Tomato Sauce," a 15-minute sauce enhanced with a little grated onion, garlic, and fresh basil. Their tasters recommend using Muir Glen or Tuttorosso crushed tomatoes, but I set out to do a comparative tasting. I made three batches simultaneously, identical but for the tomatoes. One batch was with the recommended Muir Glen organic tomatoes, the second was made with Muir Glen Fire Roasted organic tomatoes (recommended by a friend) and the third was made with San Marzano Italian tomatoes, which are generally reputed to be the best. I deviated from the recipe by using whole tomatoes which I crushed in my hands rather than already crushed ones. For the results, click more below. All three batches were good, but they were not equal. The clear winner, in terms of taste and texture, was the batch made with the San Marzanos. Second best was the batch made with the Muir Glen tomatoes, which had a nice bright taste but lacked a little of the richness of the San Marzanos. The fire roasted Muir Glens had a slightly smoky but somewhat muted taste, and were also considerably thinner in texture. While the San Marzano tomatoes are not organic, I suspect they are made in a fairly traditional artisanal and responsible way, so I personally would not count that against them. If you insist on organic, the Muir Glens are a more than acceptable alternative.